Colorado Springs Conservatory singers and musicians perform Monday, April 1, 2019. April is national Child Abuse Prevention Month. The sound of young voices singing joyfully about home on Monday signaled the beginning of Child Abuse Prevention Month. 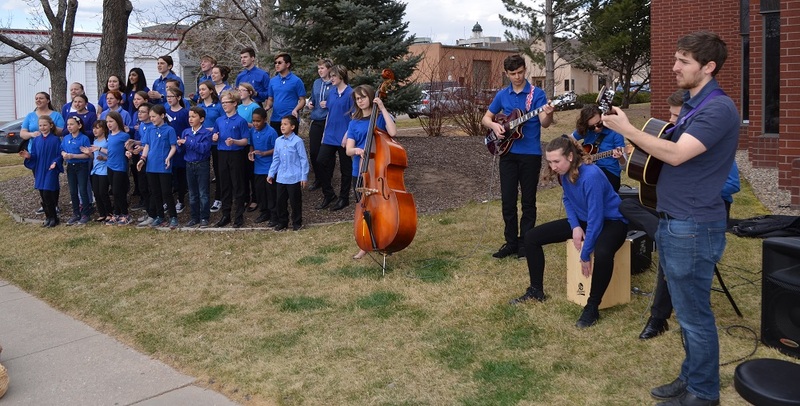 A large group of children with the Colorado Springs Conservatory performed the song “Home” as the Department of Human Services, County Commissioners and others from the community gathered to mark the start of Child Abuse Prevention Month. “Home” highlights the need for 100 new foster homes in El Paso County and there will be a robust recruitment effort in April. About 50 children have been practicing the song, and young singers will perform at several events around the County in April. The event at the Conservatory concluded with the planting of more than 200 pinwheels. Prevent Child Abuse America introduced the pinwheel in 2008 as the national symbol for child abuse prevention through Pinwheels for Prevention. The pinwheels serve as the reminder of the happy, playful childhoods desired for all children. Children plant pinwheels at the Colorado Springs Conservatory on Monday, April 1, 2019. April is national Child Abuse Prevention Month. The El Paso County Department of Human Services received more than 16,000 reports of child abuse and neglect in 2018. “The Department of Human Services strives to protect children and help families create safe, happy homes,” said Julie Krow, El Paso County Department of Human Services executive director. The long-term effects of child abuse and neglect are felt by the whole community, and need to be addressed by the entire community. On April 11, 2019, there will be another pinwheel planting event in the front of Centennial Hall, and a Proclamation reading recognizing National Child Abuse Prevention Month. Both events are scheduled during the regular Board of El Paso County Commissioners meeting. A detailed calendar of events for April is online. This April, let’s recognize the many roles that we can all play in preventing child abuse and neglect. 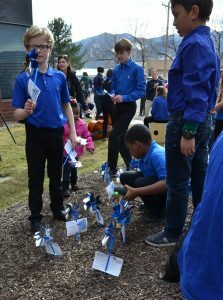 Communities across Colorado are planting pinwheel gardens and wearing blue as the sign of collective commitment to prevent child abuse and neglect. 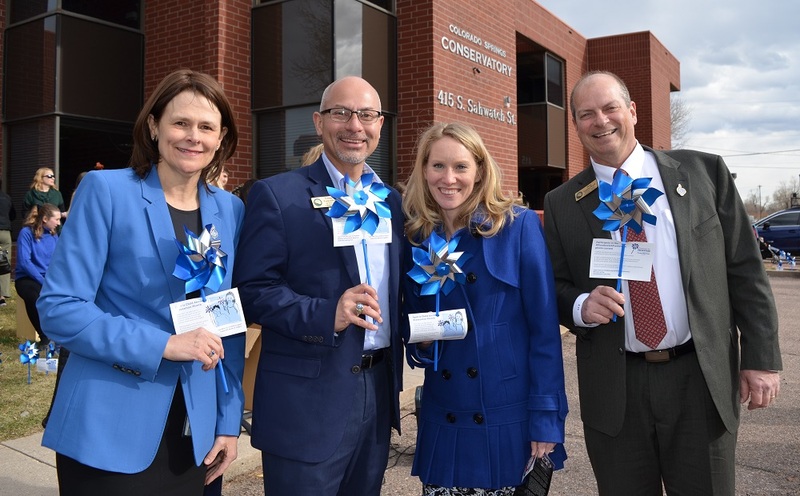 From left, El Paso County Department of Human Services Director Julie Krow, Commissioner Longinos Gonzalez Jr., Commissioner Cami Bremer, and Commissioner Stan VanderWerf at Colorado Springs Conservatory Monday, April 1, 2019, to mark the beginning of national Child Abuse Prevention Month.